amazing and we are so grateful that we found them! We will continue to use them any time we need DJ services! Please do yourself a favor and reach out, you will not be disappointed! So Much More Than A DJ! 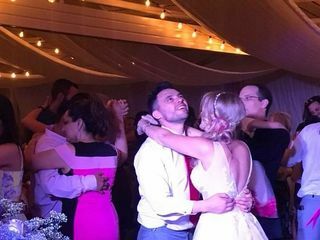 We hired DJ Flo for our wedding on 3/29/2019 and were SO pleased with their service! I had initially reached out to Stacey, but somehow missed her response. She ended up reaching out to me a month later to follow up and see if I was still in need of a DJ, and I'm so thankful she did! She went above and beyond just "playing music" for our wedding, and was so helpful throughout the planning process. Leading up to the wedding, she gave us "bridal homework" with popular song recommendations for the various parts of the ceremony - I had no idea there were so many parts and would have been so overwhelmed without this list! She created a timeline for us and was happy to make changes based on the timelines given to us by our photographers and videographers. On the day of the wedding, she had all of her equipment set up as soon as vendors were able to start arriving. She let me get settled in before stopping by to introduce herself and her assistant, Karla. At first, I thought Karla was part of the bartender team because she made certain that we had a drink in our hand at all times! I don't think I had to go to the bar once! She even brought our dinner plates to our sweetheart table. Stacey was always there to help me bustle my dress whenever it came undone. We got carried away with the evening and almost forgot about our sparkler exit. Our photographer had already left for the evening, so Stacey organized all of our guests, helped light the sparklers, and even took photos for us. I highly recommend Stacey and DJ Flo. Thank you for helping us have the perfect night! I thought Stacy and her daughter were awesome. At the resort we were at they were no help good thing I had Stacy to help us I don’t know what I would have done. I would definitely hire her again. Thank so much for all you do. We loved having Stacey DJ our wedding. She had a timeline for everything from dances to speeches to the cutting of the cake. She kept on top of things and played music that got my guests on the dance floor. We really loved having her and would definitely recommend her to our friends and family! Dj Flo went over and beyond! She made sure me and my now husband always were taken care of whether it was needing a drink, fixing my dress, following the timeline she prepared and on top of that they even helping cleanup during the reception! they really did go over our high expectations for a dj not to mention great emcee voice. Everyone was dancing and had a great time! We even recieved multiple complaints on how great our dj was. I’m not sure what our next event will be that will require A dj but I can’t wait so we can use dj flo once again! Thank you dj flo for making our wedding memorable. DJ Flo made the whole reception a blast! They made sure to stay on track with the timeline, they kept the music and the guests flowing and partying. I don't know what I would have done without them. And on top of all that they're very kind and understanding, really great people. I couldn't have done my wedding without them! Love DJFlo. Most amazing djs ever. I highly recommend them for any event. Theu are very reliable, affordable, and the most nicest, respectful and sweetest djs ever. They made mt night. My father missed his fsvorites song when he stepped out for a but. They saw he walk back in and replayed the song just for him. December 29th 2018 was the date of my wedding after waiting 11 years. We wanted everything to be just perfect! 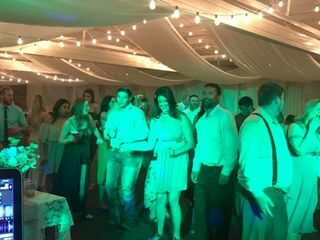 Not only the DJ flow help to make our wedding memories amazing... She also helped to coordinate with her husband continue to play the music. She never skipped a beat. She also referred me to my most awesome photographer! If I had to choose all over again I would definitely go with DJ flo entertainment! 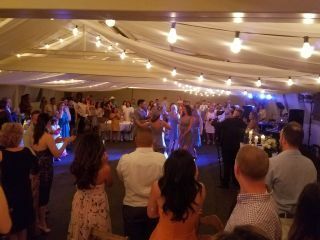 DJ Flo was the perfect fit for our wedding! Stacey and her assistant Karla did a fabulous job! We had given her tons of music that we want played and she played everything that we wanted. She was also fabulous about keeping us on time and juggling all the other vendors and people to keep the night flowing smoothly. I recommend DJ Flo to anyone who needs an amazing DJ! DJ Flo was awesome and fun. Music was current and so fitting for our event. We had them back again with a different theme and they changed it up to match. They are customer focused and professional. Can't go wrong with DJ Flo. A great choice for your event. Very professional and really made our event into a party of a lifetime! I got married this past weekend and it was the best day of my life. DJ Flo & Stacey played a major part in making everything so special. From our grand entrance at the reception, to the music, the games, and all the little things they did throughout the night......everything turned out better than I could've imagined. Stacey was extremely responsive leading up to our big day and incorporated everything we asked of her without missing a beat. Our guests couldn't stop talking about how much fun they had. I can't say thank you enough!!! Such an easy and pleasant experience! DJ Flo has been responsive and accommodating since day one. Such a happy and wonderful team and would recommend them to anyone! Dj Flo Entertainment has continued to be our DJ every year at our event for the past 4 years. They are extremely easy to work with, especially with all of our requests for special playlists during various parts of our event. Their music is always appropriate and fun! We just love them and hope they will continue to be our “go to” DJ in the future. Seriously amazing! Words cannot express how thankful I am to have had these two at our wedding and reception! Set up was spot on what we wanted and needed for the ceremony and reception without us asking or needing to help with setup or take-down. The pre-selection of music was done based on their well structured music request guide sent before the big day and they followed everything perfectly! They had every song we wanted and even presented reception games that months after the wedding people are still talking about! 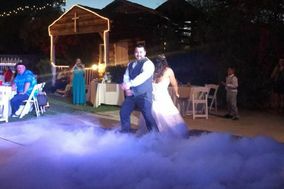 They not only provided music, setup, and game options, they also assisted with organization and movement through the entire ceremony and reception. This team is the total package! I could not have asked for better service and quality when it came to what I paid and what I expected. Definitely recommend them to anyone and everyone I know. Lighting was perfect and they worked with our photographers, music selection was great and they kept our dance floor FULL for the entire reception; we had 50ish guests and the dance floor was never empty 6pm-11pm, They were constantly in communication with us on any requested songs from our guests that may have been an issue and the classic songs people have to play to try and get everyone on the dance floor were not needed because these two read the crowd well and a perfect setup! Ask and you shall receive and if you don't remember to ask they do! Spot on DJ and entertainment, you can see/feel/hear their experience in their excellent work! Stacey and company were crucial in making our wedding a success, I can’t say enough good things! And for half the cost of some of the other DJs we talked to, while being 10x more invested. In our totally DIY wedding, Stacey and her assistant coordinated the schedule, kept people moving, even ran drinks and helped clear up a clogged food line when things went a little wrong. Not to mention the impeccable MC-ing, invaluable suggestions, and awesome dance music! 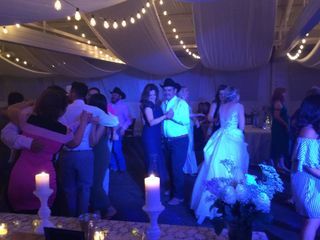 We had a multi-cultural wedding with Spanish and Italian dance songs that they integrated perfectly with the standard dance mix. We were not an easy group, with 150 people and no wedding planner/caterer/venue help. 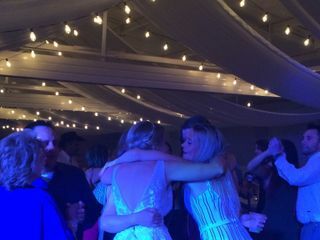 I can’t stress enough how Stacey and her wonderful assistant filled many of the gaps in keeping the flow of the wedding despite all of this, without skipping a beat in the music and announcements. In addition, they brought two sets of equipment for our ceremony and reception, and took no management on our end getting set up and broken down. All of it went so well, and we had dozens of guests up dancing at all times until the very end of the night when we had to actually kick people out. It was perfect, and I seriously can’t say enough how crucial our DJ/MC was in it all. I would use them again in a second, and highly, highly recommend them! Especially if you may need a little help yourself, they will be there for you. Five stars! DJ FLO were so great to us! Made our day fun and their was not a dull moment. My entire family loved them and so did we. Music was great and the level of noise. They went above and beyond for us! Made sure everything was perfect but most all they allowed my husband and I to just relax and actually enjoy our day! I couldn’t of been any happier! Thank you DJ FlO for making everything just perfect! You guys rock!!! 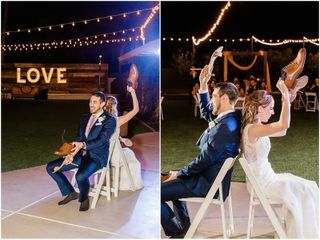 This wife/ husband duo did an amazing job of coordinating the event and keeping the party going with perfect song selections! They are worth every penny! WE LOVE DR FLO ENTERTAINMENT!!! Stacy was such a blessing to work with not only did she help us with music selection she helped us coordinate the room layout, the schedule for the evening and even referred us to a great photo booth vender. The team the night of were just as amazing. The room looked great and party was hopping all night long. CANNOT THANK DJ FLO ENOUGH!!!! HIGHLY RECOMMENDED!!!! DJ FLO Entertainment always does a great job with hosting our school dances! There services are affordable and there set up is fantastic. DJFlo was amazing!!! They saved the day and were so responsive and accommodating to our requests. They went the extra mile to make sure we had the best day ever. Thank you DJFlo you are the best!!! DJ FLO was AMAZING! They donated their time to help our Non-Profit, but treated it as a full paid job. I/We are beyond grateful for their generosity, customer service, easy-going demeanor, professionalism, gratitude, ... I could go on! I am so thankful! Stacey and Marty were amazing to work with! From the start they responded to emails quickly, and answered any questions I had. Stacey even sent me my “bridal homework” to fill out. Once I sent it to her, she responded back with a timeline of our day. Extremely organized, and they made our day run so smoothly! Stacey even helped me bustle my dress and went and got our dinner for us so we didn’t have to stand in the buffet line! Such an amazing duo, and I would recommend them 100%! !